This entry was posted on January 25, 2010 at 11:38 PM and is filed under baking, food events, food security. You can follow any responses to this entry through the RSS 2.0 feed. You can leave a response, or trackback from your own site. What a creative idea, Michelle. Congrats for getting this up and running. No mess, no guilt, no need to run a mile to work it off! Thanks for sharing about last week’s bakesale; sorry we missed you-but truly there was so much love and good energy around Pizzaiolo, that day, let alone all those divine desserts. Samin is a wonder and it was a joy to participate in the small way that I did–bringing my bags of “granola” as you mentioned. 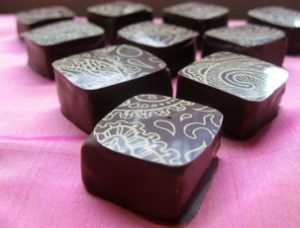 In fact, I just posted the recipe for it on my site with a link to a second bakesale by Chez Pim in the Santa Cruz area, this Sunday. Some of your readers might want to know. I hope you enjoyed the creme brulee. Thanks for the edit and shout out! Hi Kevo, Your creme brulee was dreamy, and my son and I consider ourselves creme brulee afficionados. So two thumbs up in our house! When I read about events like this one, it makes me wish Cape Cod had some of the same energy and top-notch foodies necessary for a mega bake sale of this calibre to succeed. Wow! $22,000. Kudos to the organizers! I know, Alexandra, that’s a pretty impressive sum for cupcakes and such, isn’t it? Of course, this being the Bay Area, there were lots of gorgeous, high end sweet treats as well. What a fabulous thing to do – and what a wonderful sum of money to raise! “A little sugar shopping for a good cause”? What a wonderfully sweet idea. Wonderful and inspiring. Good job Sarah! I’m impressed and moved by all this hard work. What a great idea! It sounds delicious. 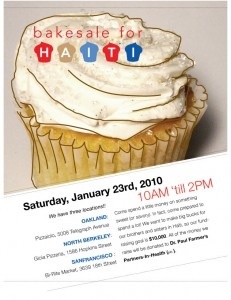 I wish I lived closer to the Bay Area–a combination of pastries and a good cause. Fabulous idea. Wonderful idea! Kudos to all who participated. I was so so sad to miss this, but I didn’t hear about it until I ran into Nani in Menlo Park. She mentioned it and I wish I’d known ahead of time! Maybe we could post these kinds of events on the Bay Area Food Group e-chain? I know I appreciate seeing upcoming food happenings there. Now I just have to remember to follow through when something floats across my desk!